She is an oil painter by profession and you can feel that her being is thriving in the arts. Kristy Throndson's creativity cannot be left unnoticed and I am proud to introduce her and her Catalina Inspired creations to you. In her lifetime Kristy has explored many media, including watercolor, textiles, sewing, jewelry and more. While living on a sailboat for four years, she was challenged to become really creative with materials and processes and in her work she is still influenced by the time spent in the water. Today, in Kristy's shop you can find charming crochet headbands and jewelry, glass tile pendants and extraordinary repurposed notecards. Clearly, Kristy has an excess of creativity which many people, I am sure, are glad to enjoy! 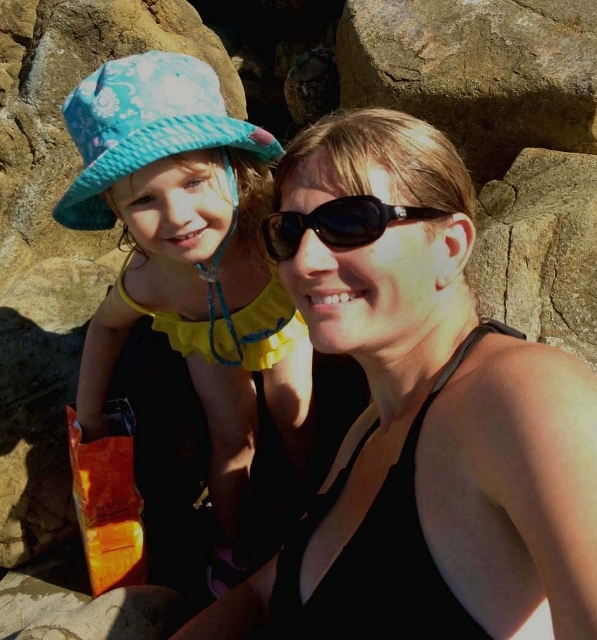 Here is what Kristy had to tell me about life, inspiration and creativity from her little paradise - Catalina Island where she lives with her husband and 2 year old daughter. 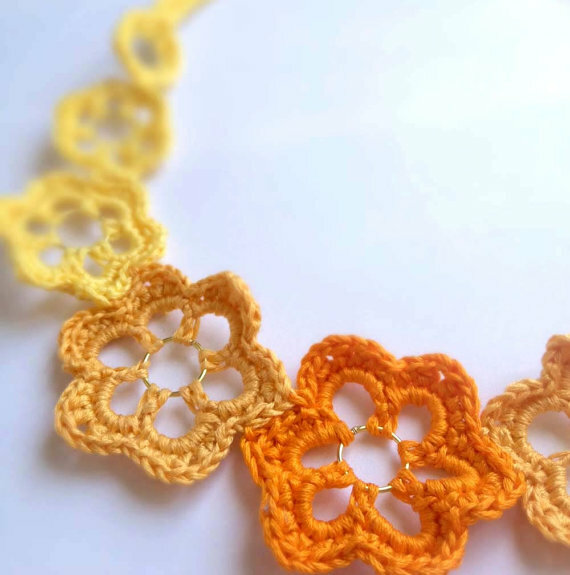 When did you discover crochet and how long afterwards did you open your etsy shop? I actually learned to crochet rather recently. I was formally trained as an oil painter at the Maryland Institute, College of Art in Baltimore, but I have always enjoyed experimenting with different art forms. 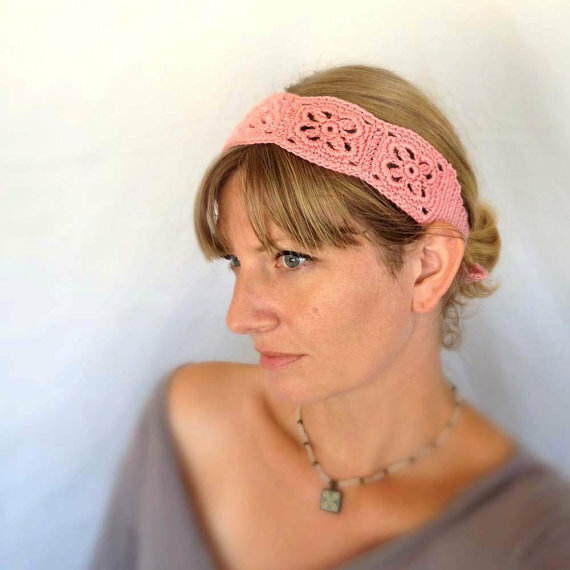 The inspiration for learning to crochet came when I saw a beautiful crocheted headband in a catalog and suddenly, I just had to learn to make one. After learning the basics and through much trial and error, my original crochet headband design was born. I enjoyed creating (and wearing) the headbands so much that I bought more yarn and kept on going. I began selling them at craft fairs and when I saw how popular the headbands were, I opened my Etsy shop in September of 2010 and have crocheted and sold at least 300 headbands since starting out. About a year and a half ago I started crocheting jewelry, hats and handbags as well. It's a wonderfully relaxing process. Catalina island looks like a divine place to live. How do you manage to keep your head cool and not loose yourself in its beauty? Catalina Island is truly an inspiring place to live. More than 80% of the land is preserved by the Catalina Island Conservancy, so there is no development allowed in those areas. This leaves the far majority of the island in its beautiful, natural state. I could easily spend every day hiking, swimming, kayaking or just laying in the sun and it's very tempting. This is especially the case in the summer, when the guests at the small hotel I manage, walk by my door in bathing suits and smell of coconut suntan lotion. Fortunately (or unfortunately), I'm often not able to leave the hotel property unattended (which is also my home) so I'm available for our guests. I reward myself a day or two a week in the summer to indulge with a dip in the ocean or an afternoon in the hills. Sometimes I just take an hour out of my day to walk to the beach, take a quick swim, then return to whatever project has my attention that day. Catalina Island is a wonderful place to live and has inspired so much of what I create, for example my Spanish/Mexican tile-inspired, original jewelry. Its beauty is also a constant reminder of how precious our planet is and how important it is to leave as small an environmental footprint behind as possible. You say that you like to work with different media like yarn, glass, fiber, and lately I can see some impressive postcards in your shop. How do you streamline your creativity? Honestly, my creativity isn't very streamlined at all. In fact, it's literally and figuratively, "all over the place". It's very easy for our tiny apartment to get overwhelmed by my partially completed projects. For the last two or three years, I've been trying to find new uses for materials that are usually discarded as trash. The lotus flower note cards I've been working on recently, are made using breakfast cereal boxes, junk mail and packing materials. I'm sure you can imagine how easily this type of project can grow out of control. I've always had several projects going on at once and sometimes my focus isn't very acute, bouncing from one idea to another. Every artist has his or her own creative process and for better or worse, this is what seems to work for me. Which of the products you sell is the most time consuming? Can you take us through the steps of the creative process? Though I've never actually timed the process from start to end, I believe my original Catalina Tile jewelry must be the most time consuming. The tiles are my own design, although I did experiment with some designs from Barcelona, Spain a short time ago. In the end, I liked my own creations better, so I've discontinued using the Spanish tiles. My tiles are first, spontaneously, hand-drawn on graph paper at a scale of about 5" (12.7 cm). Then I play with color combinations by applying colored pencil, watercolor paint, or I'll even pick up my daughter's crayons, which can be found almost anywhere in my apartment, when I'm too impatient to get out my own supplies. Next, my computer and scanner get powered up and I transfer the hand-drawn images to digital format. At this point, I usually tweak the color scheme a little more and reduce the size of the tile to around .5" (or 1.3 cm). I print the tiles on high quality photo paper and cut them out individually. The tiny photos are then mounted on square, glass beads and coated with a nice thick layer of shiny two-part epoxy resin. 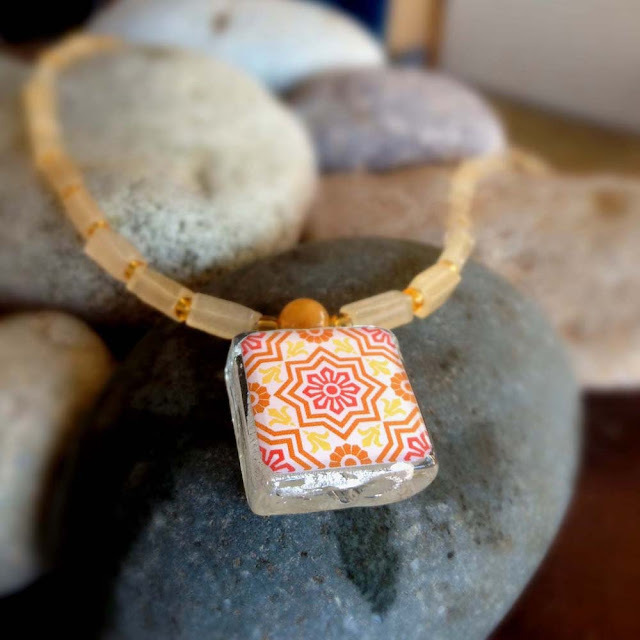 From there I string the tile pendant with complementary glass and metal beads and it's ready to wear! It's quite a time-consuming process from start to end, but it's a labor of love. I find it very intriguing that you have lived on a sailboat for 4 years. How did this experience enrich you as an artist? Living aboard an old, simple, sailboat enriched and forever altered my life in many ways and I often find myself longing for that simple life again. The boat I lived on (a 35 foot, 1972, Allied Seabreeze Yawl) had limited electricity (one 12 volt battery), no refrigeration, heat or microwave. We filled our fresh water tanks with gallon jugs motored from shore in our eight foot, outboard powered, tender. We heated shower water with the sun and cooked our food on a two burner propane stove and oven. When my former partner and I first considered this lifestyle, I assumed that living without the conveniences I'd taken for granted my entire life would be really difficult, especially at first. This was not the case at all! I loved the simplicity of life aboard from the first day and felt so good about how tiny my environmental footprint had become. It was actually fun to think up new ways to save a few more drops of water or kilowatts of battery power. I took showers with about a half-gallon of water! As an artist, I was forced to consider space and the scale of my work shrunk considerably. No longer could I keep things that weren't useful and I learned to reuse materials and buy supplies that served more than one purpose or were absolutely necessary. All of my materials had to fit into a small plastic tote or be rolled up and stored along side my small bunk. Just like every other aspect of my life aboard, my creativity was forced to conform to the limits of space and energy and it developed in amazing directions I never would have dreamed. I've become more and more concerned with living an eco-friendly existence the older I get and the more I learn. I was a vegetarian on and off for years but finally made the commitment a few years ago. After learning about how harmful and cruel the animal-based agricultural industry is to the environment as well as to our health, this past March, I dropped all animal based foods from my diet and only use cruelty-free soaps, bath products, cleaning products, makeup, etc. I don't at all miss meat, milk, cheese or eggs and I feel very healthy. I highly recommend watching the documentary film "Forks Over Knives". It was very inspiring and is what gave me the final push to commit to an animal-free diet. I absolutely love not having to own a car since I can walk anywhere I need to go, but I definitely have behaviors that need serious modification. As I learn more, I'm sure I'll change other aspects of my life that I've avoided confronting. I guess there's always room for improvement, but you don't have to be obsessive either. I think the most important part of living a simple, environmentally conscious lifestyle is being open to learning new things and not being afraid to change your behavior. It's never too late! This is a really difficult question since there are so many items I see on Etsy every day that leave me awe-inspired. My favorites can change based on my mood, the weather or almost anything. Today I saw a beautiful charm bracelet that was made using recycled soda cans. 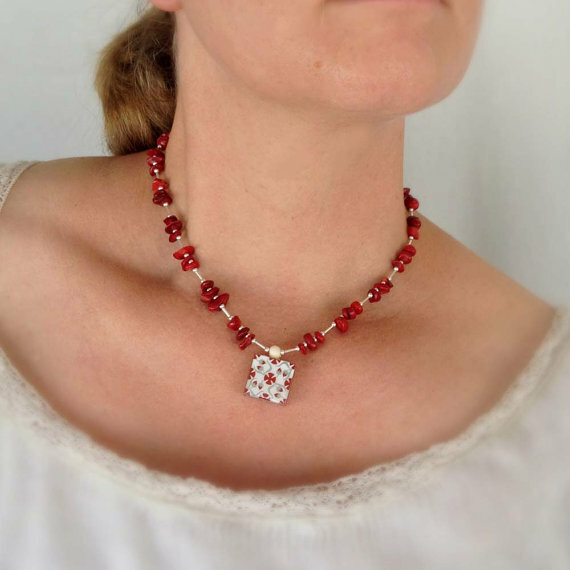 I love the color, texture and of course, the notion that the charms are made with repurposed items which would have typically ceased being useful when they became part of a landfill. I'm constantly impressed by how inventive Etsy craftspeople are. It's a wonderful community to be a part of. Blog: "The Process 1, 2, 3"
Isobel, thank you for stopping by! Although crochet might not be your calling, your soft toys look so adorable and I admire your creativity. We all have a lot to learn from you. Very cool post, nice read for a Monday! Thanks so much everyone for your kind words. If you're ever on Catalina, Melody, look me up! Love your adorable critters Isobel! Her pieces are so lovely! I was never very good at crochet, and I am always amazed at what can be done with a needle and some yarn. Thanks for sharing her story. This is awesome! My daugther loves this. I called her when I saw this and she's really want to make her own stuff. Thanks for sharing this great article! So fabulous!